Journalists at a series of weeklies are considering a strike just weeks after a previous one ended amid a fresh row over Christmas holiday leave. The National Union of Journalists has announced it is balloting members at its Newsquest South London chapel, claiming the company is trying to “cancel Christmas”. The chapel says it has been promised there will be a total of 12 reporters working on Newsquest titles in the south of the capital by Christmas, but claims staff are being ignored over holiday requests for the forthcoming festive season. 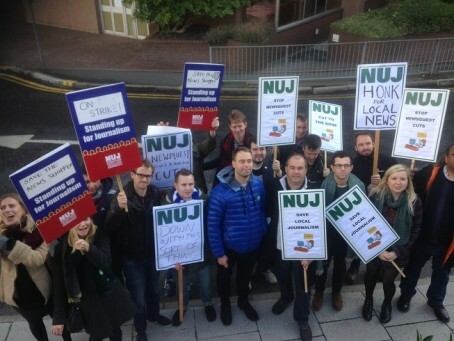 Journalists at Newsquest South London went on strike for a fortnight in October, and have been undertaking a ‘work to rule’ ever since. The union says the newsroom is currently being staffed by 10 reporters, with one journalist having handed in his notice days after returning to work, while editor Andy Parkes has asked Croydon Guardian readers to write the news themselves and publish it on the paper’s website as part of a “simplified process” for sharing stories. A chapel spokesperson said: “We came back off strike to prove to the company that what they were asking of us could never work, but it came as a shock to see just how disorganised and poorly planned our new structure is, and just how willing Newsquest is to kill its own products. “Newsquest’s new initiative to have readers submit their own stories – because there are too few of us to cover community news properly – is embarrassing, and will further undermine us as a local news outlet. We should be telling people what’s happening in their local community. Instead, we are asking readers to do our jobs for us. It’s farcical. “We have been promised 12 reporters by Christmas, but with staff continuing to resign while people who are offered the jobs continue to refuse them, it’s hard to believe Newsquest can even manage this. In the meantime, we keep asking for holiday time over Christmas to be approved or even talked about, but we keep being ignored. “Content editors ” are using the public in place of professional journalists to provide content and as the spokesman has rightly said it’s embarrassing, it’s not just NQ who are guilty of this lowest form of dumbing down either, other publishers are using this cheap and cheerful cop out with the result being the end products proving to be worthlesswith thousands of readers gone and local business people seeing no value in advertising in such weak publications. Sadly with quality staff gone,experienced editors replaced by desk bound mouse pushers and a reliance on free content to fill the space between the (few) adverts that remain, the end of the uk regional press will be here quicker than many thought possible,strike or no strike . Wth more reliance by all local press groups on reader supplied copy,stories,leads,features and photos, “content” editors,chiefs,directors or whatever they call themselves these days are talking themselves out of a job and is an area the financial bods and the boards should be looking at when cost savings are required,big salaries cut with little or no (further) detriment to the end product. Then why not go the whole hog and pay readers commission for selling adverts in their local communities and do away with over paid and highly bonussed ad reps and ad managers,there`s so little revenue being sold thats not tied in on heavily discounted annual contracts which are managed by support and admin staff that they too are becoming a luxury companies can no longer afford. The day of the DIY local newspaper looks to be evolving ever closer given the way the regional press is steering itself. 2017 will be a very interesting year indeed. While I sympathise with those whose jobs may be under threat, journalism is one of those industries where Christmas working should be expected. In this day and age it is not uncommon for companies, and not just those producing newspapers and websites, to ban holidays over the Christmas period. Yes, this should be laid out well in advance and should be made clear to employees when they start a job or if the rules change. But it is a fact of working life today. I am working on Christmas Day (and Boxing Day for that matter) and I volunteered to do it. I’ll still have time at home. news is something readers have not known before. If they are sending it in, it ain’t news. But it is cheap, even free, and that is the bottom line in all local journalism now, sadly. Holidays at Xmas, I served many years in prison (regional newspapers), nobody was allowed holiday at Xmas.